Cardinal to present 125 Cheverus Award Medals Nov. 25. Published 11/23/2018. Local. BRAINTREE -- Cardinal Seán P. O'Malley will present 125 Cheverus Award Medals to laypersons, deacons, and religious during a 2 p.m. daytime prayer service, Sunday, Nov. 25 at Immaculate Conception Church in Malden. Inaugurated in 2008 at the close the archdiocese's bicentennial year, the annual award ceremony recognizes local Catholics for their dedicated service to the Church. Each year, one-third of the parishes of the Archdiocese of Boston are asked to nominate a parishioner for the award. Most recipients are nominated by their pastor and approved by their regional bishop or episcopal vicar and Cardinal O'Malley. The criteria given to pastors suggests that the nominee be a layperson who has served the parish over an extended period of time and has done so in a quiet, unassuming and unrecognized fashion. In addition to the nominees from parishes, each year the regional bishops and episcopal vicars are asked to nominate a religious and a deacon from their region who are deserving of a Cheverus Medal. The Central Ministries of the archdiocese also make nominations from among religious, deacons and laypersons who serve on archdiocesan committees or lead key ministries. Some additional recipients are selected personally by Cardinal O'Malley. "We look forward to this wonderful celebration each year," said Cardinal O'Malley. 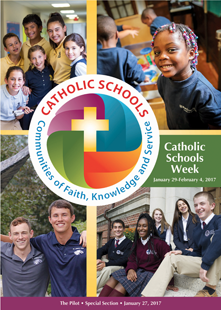 "This is our opportunity to say thank you to the many people in our parishes, schools and ministries for their extraordinary generosity and commitment in service of the Church in the Archdiocese of Boston. The award recipients and their families have demonstrated a commitment to the poor, the forgotten and in passing on the faith to our young people among many other examples. The Cheverus Award is our opportunity to express our gratitude to those who quietly and consistently make significant contributions to the life of the Church in the archdiocese." The medal is named for the city's first bishop, Jean-Louis Lefebvre de Cheverus, who led the diocese from 1808 until his return to France in 1824. Bishop Cheverus died in 1836 as the archbishop of Bordeaux. The oval-shaped medal bears a likeness of Bishop Cheverus based on the Gilbert Stuart portrait. On the reverse side is Bishop Cheverus' coat of arms. Due to ongoing renovations at the Cathedral of the Holy Cross, this year the ceremony will be held at Immaculate Conception Church in Malden, which is located at 600 Pleasant Street. The church's parking lot can be accessed through entrances on Pleasant Street or Fellsway West. There is no limit to the number of family members and friends who can join the honorees in the church. The presence of the pastor and a delegation of parishioners is encouraged to help underscore the appreciation and gratitude of the parish towards the honoree. At the conclusion of the prayer service, a reception with light refreshments will be held in the lower level of the church.